Connect with nature at your next birthday party. Bugs, bees, birds … or a little bit of everything! Choose from one of the following themes, and let us help create an unforgettable experience. Imagine you are a squirrel, a deer, or a rabbit. How would you survive in the forest? Play active games that show how animals manage to hide, find food, use camouflage, and communicate with each other. Seasonal activities may include snowshoeing or a creek walk. Come fly a kite! Watch your kite climb towards the sky and chase the clouds. See how we can capture the wind’s energy to fill a pond and generate electricity. For an additional $4/kite, make, decorate and take home your own kite. Journey back 400 years and learn to survive like the Wendat people who lived on this land. Spend your big day grinding corn, tracking animals, using primitive methods to start a fire and playing traditional Aboriginal games. Whether it is a river, marsh, pond or swamp, Kortright’s wetlands are fascinating habitats to explore! With a dip net in hand; search for frogs, fish, turtles, invertebrates and more. Play games and learn what you can do to help save our wetlands. This exciting program focuses on the plants and animals of Kortright. 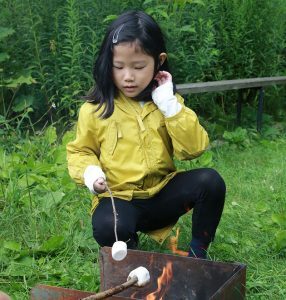 Become a nature spy through hands-on activities including nature games and activities, touching furs and feathers and hiking through Kortright’s many amazing habitats. This program is seasonally adjusted for year round birthday fun. Spend your special day dressing up like a bee keeper and tasting pure honey made from Kortright’s bees. Get really close to Kortright’s active bee hives from the safety of a screened-in building. Learn about “smokers”, “supers” and other beekeeping equipment. Become an owl explorer for the day! Keep your eyes and ears open for our feathery friends as you hike through owl territory. Learn to “hoot like an owl” and dissect owl pellets to see what the owls have been eating. Tiger Beetles, Ambush bugs, Dragonflies and Painted Lady Butterflies are just some of the amazing insects that call Kortright home. Learn about these fascinating invertebrates during this hands-on program. Party goers will be given the opportunity to catch, observe and release a variety of insects in different habitats. Our themed parties are designed for children from four to 12 years of age. To ensure everyone has an enjoyable time on their special day, we do require the birthday child to be at least four years old. Parties are three hours in length (two-hour program and one hour for food and cake). All parties are led by a Kortright Nature Guide and include a themed hike through the forest and nature games. Add a Marshmallow roast to your party for just $1 per participant. Each party has an outdoor component. For your comfort, we suggest you dress for the weather on the day of your visit and that participants wear closed-toed, flat-soled footwear (such as running shoes). NEW! Add a one-hour animal show to your party! Additional fees apply. Based on animal availability. Minimum three weeks notice required. Available for select programs only. $300.00* for up to 15 children and 3 adults. There will be an added charge of $10.00 for each additional child and $6.50 for additional adults. There is a 10% discount for members. A 50% deposit by VISA, MasterCard, or cheque is required at least four weeks prior to the party date. Cancellations must be made in writing at least 15 days in advance or the deposit is non-refundable. A 10% administration fee will apply to all cancellations. Same-day cancellations or no-shows will be charged the full cost of booked participants. Our birthday programs are suitable for groups of up to 25. Parties are three hours in length and can be booked between 10 am and 4 pm. All options include: Coffee, tea, juice, water, plates, cups, utensils and napkins. NOTE: Food orders must be placed at least one week prior to event date. Kortright Centre is the ideal setting for picnics of all sizes — from large gatherings to simple family get-togethers. We offer two large open areas with restricted access suitable for a range of activities, including entertainment and food service. For information and bookings, please contact bypeterandpauls.com. Shelter and hydro, close to the Visitor Centre and Innovation Trail. Ample parking nearby and access to washrooms in the main building. Open site located on a large field. Ample parking available in Kortright main lot. Open to the elements. Portable toilet rental required.